very very impressive build, and glad to see all the hard work paid off for you! Sorry, that I still haven't answered all of your congratz. I just wanted to make this online asap. Here we have the Pro class Finals course driven by me. I was the only one to make it to the finish. DARN, those bullies hold a pretty much stress and pure BROOD power!! Thanks Fritz for the video! This is how it all got started. Me and my friend Samuli were driving in the pro class at the USRCCA Nationals last September. Then we saw these new axles in Snipers truck at the quey. Samuli told me: "These look pretty cool". I was thinking, that the weight is problem, cause I had been trying to lose weight in my rig for couple of years and was running with XR10 axles. Three months later just when I was finishing my XR10 pro rig Tomy contacted me in finnish forum and asked do I have intrest to get Bully 2 axles. I asked why and he told me that John is seeking for team drivers to RC4WD to represent Bully 2 axles. I was thinking, that is it risk worth taken? 10 minutes after that, I send my application to John. Next day I found out that I was one of the drivers choosed to the team RC4WD. So I thought, lets start building this. Axles - I was stoked how good the quality of the parts was. Everything seemed to be superstrong. Chassis - Since I had seen some extremely good driving and performances from LaaLaa's SuDu Pro, I didn't hesitate to jump on board. This is just beautiful and world class chassis. Links - Tomy from Nordic Crawler Designs did really good looking links matching the SuDu Pro chassis. Motors - I wanted to get the best motors in the market for the moment, so I bought Team Brood Racing 30T Stubbies. Other electrics - I decided to continue with my Castle Creations Micro Sidewinders. They have been working well, so no point of changing those. I'm also using CC 10A BEC. Giving power to the electrics is Gens Ace 450mAh 3S LiPo battery. Servo - With this, I wanted to have only the best in the market. It needs to be fast and strong, so I got Futaba BLS157HV. Tires and wheels - I had some really good results in previous season with LaaLaa's Skinny Rovers, so that was my choise in this rig as well. Then some beautiful three piece wheels from Nordic Crawler Designs. Shocks and springs - I got myself a set of Axial SCX10 shocks with Team Losi Mini-T Silver rear springs. This combo seems to be excellent for this use. Skins - I wanted to have something which could continue the old Cannibal theme. And Michelle designed these. They are just outstanding! If you need skins, don't hesitate to ask Krawler Konceptz. Radios - I've been running with Futaba 4PKS for two years and wanted to try Sanwa MT-4, because of the lever option for the dig. It feels so much better than the buttons on my 4PKS. So Sanwa was my choise. Else - Knuckle weight I got from RC4WD and they give me just enough weight for the front axle. All other carbon fiber stuff on the front axle is made by Nordic Crawler Designs. Everything was now ready for first tests in Finland! Video from the first and only training session before we left to the Spanish Nationals! Rig feeled awesome to drive. So predictable and sharp, much better that I had with the XR10 axles and old chassis. Everything was now ready for the first competition with Bully 2 axles and brand new rig. We arrived in Spain on thursday night and got to the comp site on friday morning. This was the first view. That is something else! Then I got to training with my mates from Switzerland and Germany. We had a good training session and everything seemed to hold up. And it was fun to see how well the rig actually did! Rocks in Spain was insanely grippy. Almost as grippy as the ones at Nationals in Prescott, Arizona. Supercool day to have some crawling training. +20 degrees celcius and slight breeze from the sea. You simply can't hope anything better! And in the end of the practice day I was able to climb on one spot, that nobody else didn't manage. Comp day we arrived early to the comp site. And it got even prettyer! So I took the spot and took photo of my comp rigs. Last night I ensured that every single screw wasn't loose. It always takes a little time but is well worth it at the end. This was one of the best courses for me. Results of 2.2 Pro class. It feels good to be on top of that list! VICTORY! I had so much boost of confidence from the rig working so well, that this was the only way that it could come. Bully 2 - Future pair of axles! Overall in had one of the best weekends of my life in there. Not only because of the victories, but also because the rigs were working without problems all weekend long. One screw was loose after fridays test on the knuckle, but that was all of it. Probably best thing about these axles (and you're gonna laugh when I say it) is the weight. They weight ~50g each more than my old XR axles, but they feel so much more stable and predictable to drive. Weight is keeping them down. But on the other hand they don't have too much weight on them, with crushing all the lightweight stuff on top of them. I think these axles are pretty darn good choise for anyone! One tooth is missing from my Futaba! No problemos, I found a gear set from UK. Now it's good to go for next sundays training! I had really good training last weekend. Drove just about twenty packs with it. I gave some good old beating to it on the rocks. Only thing that decided to broke, was the inner piece of my front wheel. One of the drops was too much for it. Now it's changed and this thing is ready for first outdoor comp in Finland this year. It's located on the Nordics compsite at Inkoo. Just a few quys have registered, but comp is a comp! I'll try to take pics and video again. I'm back from the first outdoor comp of the year. Sadly there were only two drivers in pro class. All in all, it was good training. Everything worked flawless and I was able to score some decent points. Back from the bonus #3 from course two. The scenery in the comp site was staggering! I had over a minute left after gate nine, so I decided to make one of the bonuses guys ran when I was at the Nationals last year. Succesfully of course. More training to get the feel from the terrain. Day was good, and the rig is still working great. I'm eager to start the finnish national series soon. Before that we still have one more comp to go. Our second local comp, where one of my opponents according to the rumours will be Tomy! After all I want to save my stubbies! As usually pics and vids will follow. I'm back from the first Finnish Series comp with a good result! On the morning the weather was damp but not wet. Thank god! Doin' the second course. Clean performance! The next gate was tricky but Koppensneller did manage. 1st spot for me! LaaLaa made it to second and R2 third! 1.SuDu Pro 2.SuDu Pro 3.LaaLaa Special 4.SuDu Pro 5.LaaLaa Special 6.MOA Pro Comp 8.SuDu Pro. NCD ftw! Appreciating all the sponsors of course! Team RC4WD did well also. 1st and 4th for the Bullies! And course five in video. Shame on that one reverse at the end. I'm really happy with this result and eager to continue after one week in Kuopio. The northern comp of the year. I think your competitors may enjoy you taking a vacation for the rest of the season....lmao!! Had to throw them BWD motor savers away and get some CF LT-designs Stubby sized motor savers! At front it was a tight fit. These are awesome to look at and will probably hold better than BWD's. On saturday we'll continue on comping. Last comp before the Nordics! I'm back from the second finnish rc crawling series comp in Kuopio. I had quite long friday night, you may know what that means... I had put the passenger front tire to the passenger rear place and the rear to fronts. I didn't notice this until the last course, when the rig looked funny. Basically I had four different offsets at the same rig. This could have effect on the rig at some points. With this "bad" day behind, I managed to get the second position after LaaLaa (not in the pic). Now we are dead even on the series, so it's going to be one hell of a battle if we think forwards to the rest three comps. I was good in every other course, but totally stupid mistakes in course four. After I rolled the rig over three times my tires was full of mud and sand, and it was really hard to get it going again. So that's DNF from there. Too bad I didn't saw LaaLaa doing the perfect run on that course. That was really badass performance from him! Here's course two in video. This went well. Next comp will be The RC4WD Nordics 2014. Pro class is the only one so far, that I have never won. After three weeks we are trying to make this statistic go away. 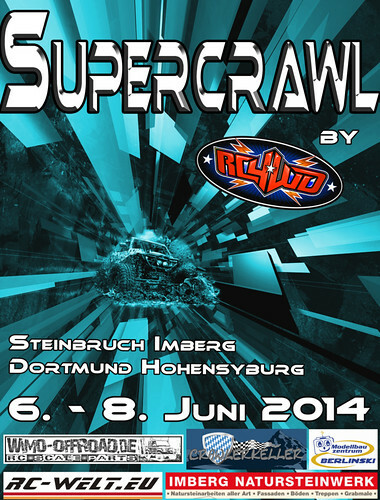 I have good memories from the Pro class finals last year in German Supercrawl, so I've decided to go this year as well!